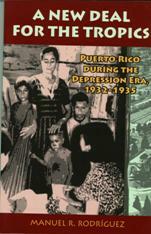 In the 1930s, Puerto Rico was economically and culturally a nineteenth-century agrarian state dominated by sugar and coffee plantations. Then came the New Deal, and the island changed forever. Puerto Rico entered the twentieth century in every respect, including its economy, culture, and infrastructure. This transformation was neither easy nor without resistance. The author capably leads the reader through this upheaval with all its ups and downs. Manuel R. Rodriguez is a professor of history at the University of Puerto Rico.